Good luck finding this at your local arcade. 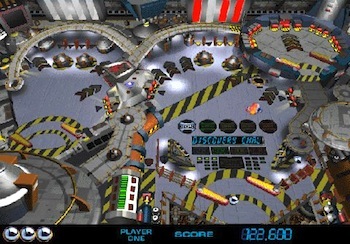 On this wiki, "Digital Pinball Table" refers to a Pinball game that exists only as software, usually running on Video Game Systems or home computers. Many digital pinballs are characterized by their use of gadgets and gimmicks that cannot exist in a Real Life pinball machine, such as monsters that wander the playfield, teleporting balls, or modes that abruptly change the rules of physics. LittleWing, a two-person Japanese software firm and one of the first software houses focusing on digital pinballs. Almost all of their games are original tables, with realistic designs free from the more fantastic elements of other digital pinballs. Zen Studios: Creators of the Pinball FX and Zen Pinball series of digital pinball frameworks, with numerous pinball tables licensed from Comic Book and Science Fiction properties. Barnstorm Games (formerly Cunning Developments/Fuse Games/Silverball Studios). With a 3D physics engine that is often praised for its realism, this is the company behind the Pro Pinball series of games, as well as Pinball Spinoffs like Metroid Prime Pinball, Mario Pinball Land, and Frogger Pinball. KAZe Co. Ltd., a former Japanese game developer best known for the Sega Saturn pinball titles Last Gladiators and Necronomicon. Pinball Spinoffs are a popular source of digital pinballs. Also see Physical Pinball Tables and Licensed Pinball Tables. Video Pinball: An arcade game from Atari, regarded as the first pinball simulation. Yoku's Island Express: A Metroidvania navigated using pinball mechanics.